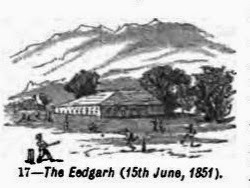 "On one glorious afternoon (15th June, 1851) I see we played on the plain of the Eedgarh [Idgah ]the first game of cricket - a single wicket match - ever seen in the vale of Cashmere: we had brought up with us gear for the express purpose. After this exercise we went, later in the day, through the tender mercies of the "hummaum" or steam bath, which oriental instituiton is not, as far as I know, except at Peshawar and perhaps Delhi, found in any other Indian city. It is a strictly Mahomedan institution, and was probably introduced into Cashmere from Persia. " ~ The Highlands of India' (1882) by David J. F. Newall. So, it is official, Cricket reached Kashmir before Football. Idgah remained a favorite spot for playing cricket. And yes, I have had a bath in Kashmiri Hamaam (Barbers shop basically often came with bathing facilities in Srinagar. Don't know the status now).